Business scandals are always with us from the South Sea Bubble to Enron and Parmalat. As accounting forms a central element of any business success or failure, the role of accounting is crucial in understanding business scandals. 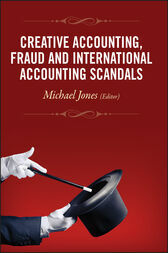 This book aims to explore the role of accounting, particularly creative accounting and fraud, in business scandals. The book is divided into three parts. In Part A the background and context of creative accounting and fraud is explored. Part B looks at a series of international accounting scandals and Part C draws some themes and implications from the country studies. Michael Jones, MA Oxon, is Professor of Financial Reporting at Bristol University. He has taught accounting for 33 years at all levels from GCSE to final-year degree course, and has published over 140 articles in professional and academic journals, covering a wide range of topics including financial accounting, the history of accounting and international accounting. and on the Committee for Professors of Accounting and Finance. He is also the author of three textbooks: Accounting, Financial Accounting and Management Accounting.